The act of pruning a tree is to remove specific stems or branches for the benefit of the whole tree. Pruning could also be used to thin the tree canopy, opening the tree to more sunlight and air; ensuring it stays healthy and free of disease. Cutting usually applies to larger branches, and is used to remove dead, damaged, or diseased branches to minimize damage from insects and other organisms. 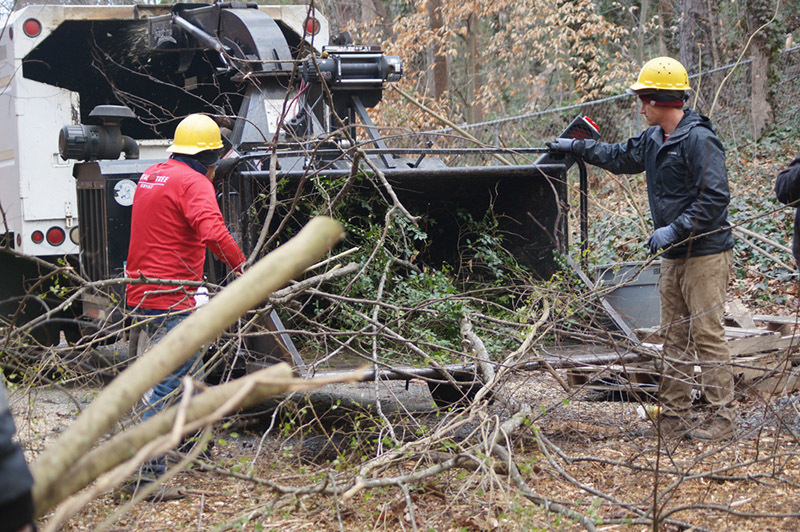 At Fast Tree we perform all of these Atlanta tree services, see our experts in action, then read below to discover the benefits of pruning, cutting, and an emergency tree service. Small branches can be pruned whenever they need to be, at any time of the year. Large branches – branches comprising over 5-10% of the crown of the tree – should only be pruned in winter when the plant is dormant, or in the middle of summer after flowering in plants that are susceptible to damage from winter frost. Plants should never be pruned in autumn due to the fact that the air is filled with diseases and decay fungi. Summer is the best time to prune plants that bleed a lot from cuts, or recover from them slowly – such as maples and magnolias. They can also be pruned after the dormancy period starts. For woody plants where flowering occurs early in the season (apples), pruning should be done as soon as flowering occurs. Waiting too long to prune will damage the flowers of the next season. Azaleas, lilacs, and forsythia are other prime examples of this category. There are a number of reasons to cut tree limbs; they may be diseased or dead; they could be crossing or rubbing against other limbs; or perhaps they are competing too much with other branches and have to be cut away. Raising or opening the canopy is another reason for limbs to be removed. This is done to open the canopy to more sunlight or provide additional vertical clearance. Winter is the best time to remove the limbs and branches of trees. Diseases are inactive during the winter and aren’t likely to damage the trees. Cutting a tree open during the summer, however, is just inviting diseases and pests into the tree. Keep in mind that there are some trees that will “bleed” heavily when they are cut, which is sap seeping out of the wound. While it could look unsightly at best, and serious at the worst, there’s no harm. Trees that are prone to this kind of heavy bleeding are birch, beech, maple, yellowwood and elm. You might think that it would be a good idea to dress these fresh wounds using wound dressings or tree paints, which are made and marketed for just such an occasion. In my experience, these are rarely necessary. If anything, they actually slow down the natural healing process of the tree. Trees are incredibly adaptable; they respond well to adverse conditions, so we advise a clean cut and allowing the tree recover by itself. It can be tough to decide the right time to remove a tree that develops problems. If a dying tree isn’t likely to harm the people or the structures around it, then it could be left to die where it is. There are also some animals, such as woodpeckers, thrive in old dead trees and use them as nests and feeding grounds. If you don’t mind the cost and you want to keep the tree, then it’s possible to extend its life by continuing to remove the diseased and dead portions and giving it plenty of water to its roots. This can become expensive or a concern to your neighbours. If it appears the tree could fall and damage their property, they will probably insist and urge you have it removed. Upon visible signs or an arborist determining the tree is doomed and a hazard, hire an emergency tree removal service www.fasttreeremovalatlanta.com/emergency-tree-removal-atlanta to ensure it’s safely removed and your property does not get damaged. If you’re in Atlanta, our emergency tree removal team is located in the heart of the city and offers 24 hour emergency services. Pruning the limbs from a tree can make the landscape around it look much healthier and better, as long as you do it properly. Pruning at the wrong time, or taking shortcuts, is just asking for future complications. A diseased or damaged tree will require cutting, but may be preserved if it is addressed early. However, when a ravishing disease or storm damage happens, emergency tree removal becomes the only option to avoid damage to your person or property.